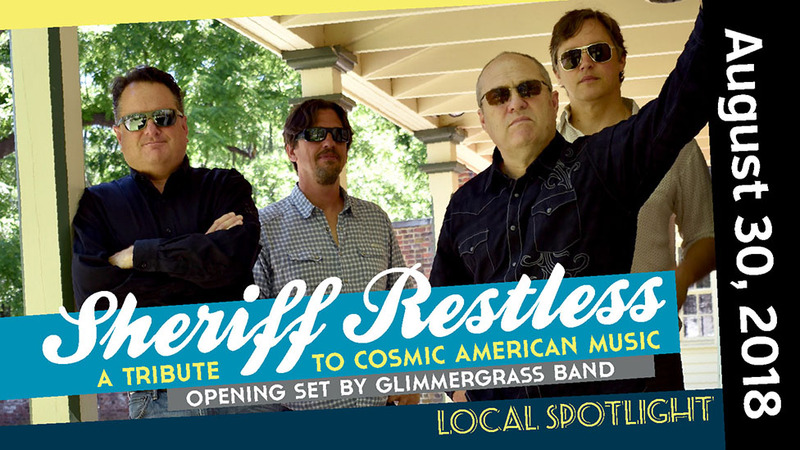 Sheriff Restless combines some of the Jersey Shore's favorite musicians in a tribute to Cosmic American Music, with an opening set by GlimmerGrass Band. Sheriff Restless combines some of the Jersey Shore's favorite musicians in a tribute to Cosmic American Music, a hybrid of country, rhythm and blues, soul, folk, and rock. This tribute is inspired by and featuring the music of Gram Parsons, The Flying Burrito Brothers, The Byrds, Johnny Cash, Merle Haggard, Waylon Jennings, Buck Owens, Wilco, and Whiskeytown. Sheriff Restless is: Bob Scrabis, Gordon Strout, Bob Giunco, John Dickson, Gary Oleyar and Dave O'Brien. Special opening set by Manasquan's own GlimmerGrass Band performing the 1973 Jerry Garcia/David Grisman Bluegrass classic "Old And In The Way" in its entirety! GlimmerGrass Band is Dave Plewa, Gordon Strout, John Dickson, Tom Stevenson, Gary Oleyar and Bob Engler.